Today I’m going to show you how to be a pastry chef at home by creating these gorgeous mini chocolate eclairs. If you are craving sweets after dinner or just for a snack don’t be shy pop a few of these whipped cream stuffed chocolate eclairs in your mouth and enjoy. How many times have you drooled over gorgeous, deliciously impressive pastries in the bakery window? I bet the first thing that you think (besides that you want to eat something) is that there is no way you could make something so impressive yourself so you just have to buy them. With a little patience and following this step by step mini chocolate eclairs recipe you too can make an outstanding pastry that will wow your family and friends. The next time you have a pot-luck or party to attend think about making these super easy chocolate eclairs and your friends will name you home chef of the year. When I’m grocery shopping or out and about I find myself walking past the bakery section to see what they have on display only to say to myself “I don’t need to buy this stuff because I can make it at home myself”. One of my favourite homemade pastries are the Chocolate Eclairs and that’s why I’ve chosen to share a recipe I’ve kept secret for years with all of you today. Don’t panic either about making pastry it’s not as difficult as you think. I’m pretty sure you will be impressed with yourself once you see just how easy it is and that you’ve just done it. So, what is chocolate eclair pastry called? Choux pastry is one of the easiest pastries to make and what we are going to make today to create mini chocolate eclairs. This pastry is made from simple ingredients that we all have in the pantry and refrigerator such as eggs, flour, butter and some water. There is no yeast involved as it uses steam and high moisture to puff the pastry hence the name, “puff pastry”. Choux pastry is a light pastry dough used to make profiteroles, croquembouches, éclairs, French crullers, beignets, St. Honoré cake, and gougères. It contains only butter, water, flour, and eggs. Choux pastry is usually baked but for beignets it is fried. This pastry can make the most stunning of patisseries from these mini chocolate eclairs and swans to one-bite and it’s gone, profiteroles. So, hold on tight because I’m going to take you on a pastry ride to indulge in my sweet Mini Chocolate Eclairs filled with a silky whipped cream. 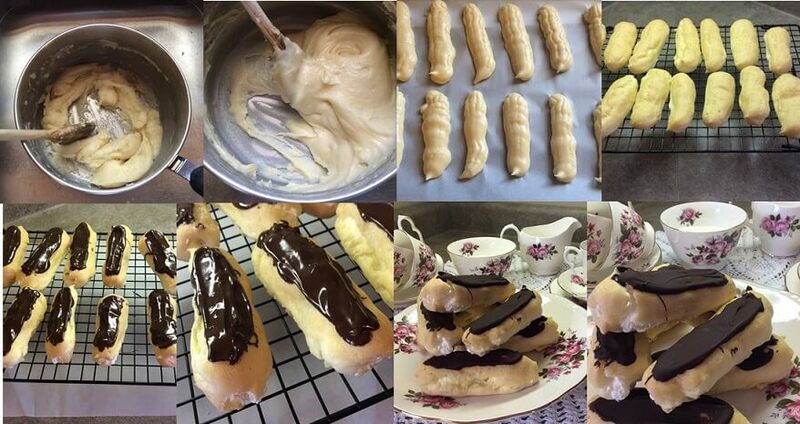 If you love chocolate eclairs filled with whipped cream why not try making them at home yourself. You will likely never spend the money again to buy them because they really are simple to make. Place the butter and water into a large pan and slowly bring to the boil, this ensures that the butter will have fully melted. With your flour place it on a piece of parchment paper. When the mixture is boiling add in all the flour from the paper into the pan and immediately take it off the heat and start working as fast as you can. Beat the mixture with a wooden spoon hard until it starts coming away from the side of the pan. Have your sink filled slightly with water as you will need this to cool you pan down before adding the eggs. When mixture has cooled add the egg a bit at a time, ensuring that its fully mixed before adding more. You may not need all the eggs if you are using large eggs. The mixture should be of dropping consistency this means that it should come off the spoon reluctantly and in one blob. On a piece of parchment paper start piping the mixture out. Use a large nozzle on your piping bag for even lines. If you pipe the lines onto a dampened baking tray the steam will help them rise. Now fill with cream ensuring that you fill both ends. See, I told you it would work out perfect if you followed the instructions! 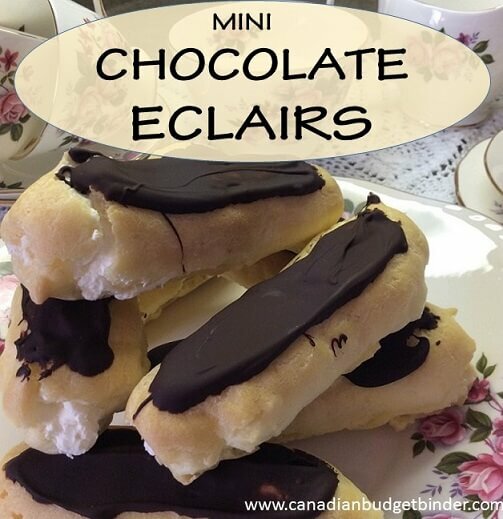 I hope you enjoy these mini chocolate eclairs as much as my family does and pass this recipe along so others can enjoy. Please Subscribe to the blog so you get my daily email and follow me on social media. Get every recipe from Canadian Budget Binder> Check out my new Free Recipe Index. Nicola, what kind of butter did you use? And, do I have to use water if I am gonna use fresh milk? These mini chocolate eclairs look so delicious! I am definitely gonna bake this this weekend. Five stars! Jason just normal butter it doesn’t have to be unsalted. To achieve this pastry you have to use water no milk. It won’t give you the right consistency you need. When you make them send us a pic! Christine put 3/4 cup of water in the pan with the butter. Lol, theses aren’t too fattening, light fluffy but yes one is not enough. There are three left and they are all mine tmoz lol. How much water do we use with the butter at the start?? They look so good!! When I make these they won’t last long enough to get to the family gathering!! Which is probably a good thing, my sisters-in-law are always on diets of some sort… They might not be happy seeing these tempting delights! My niece is getting married Nov. 2016 and her mother wants to lose a fair bit of weight before then so the mother of the bride looks good!! I’ll just have to eat as many of these as I can to save her diet…I’m such a good SIL aren’t I…. Lol! !